At last week’s AfricaForum, Samsung launched a variety of new products, ranging from new QLED TVs to windless air-condition systems. SEAN BACHER was there to get some first hand experience. Samsung Electronics’ QLED TV range, launched at CES last month, has been unveiled in South Africa just a few weeks later. The local unveiling came at last week’s AfricaForum in Cape Town, where Samsung launched a range of products for the home user. Their product announcements ranged from new TVs, fridges, freezers, washing machines and air-conditioning units. The QLED TV was possibly the biggest announcement: Using quantum dot technology, the QLEDS are said to provide richer colours with an improved colour range, offering viewers a much more detailed viewing experience than those of the competition. The QLED technology also means that the devices can display colours at just about any brightness setting, with peak luminance levels being between 1 500 and 2 000 nits. The QLED TV range includes a Q7 flat panel 55-inch 4K QLED at a recommended retail price of R32 800, with a 75-inch version going for R78 800. Its Q8 range of curved panel 4K models are available from R46 000 for the 55-inch model to R59 000 for the 65-inch TV. Also on display was the mammoth 88-inch Q9 TV, but its price was not yet available. To complement the QLED TVs, Samsung revealed its MS750 Soundbar. 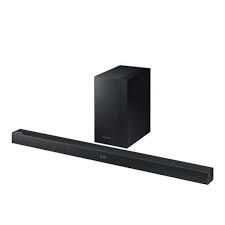 Making use of Samsung’s proprietary UHQ 32-bit Audio Technology and its own audio algorithms, the Soundbar is able to deliver loud sounds with little or no distortion. The device is small enough to be mounted to most flat-panel TVs and is connected via a single cable. This is one step closer to clearing away the spider web of cables that sit behind home entertainment systems and the single connection means that both the Soundbar and TV can be switched on at the same time. Pricing was not yet available but the Soundbar will be available at Samsung branded stores and leading retailers in the next few months. Next up was Samsung’s TMF (Top Mounted Freezer/Refrigerator). The company claims this is a first fridge/freezer combination to use Twin Cooling Plus technology, which uses independent cooling sources for the fridge and freezer. This design not only improves the efficiency of both the fridge and freezer but also prevents odours from the fridge penetrating the freezer and vice-versa. The top of the range Samsung RT7000 fridge/freezer maintains an optimum humidity level of 70% in the fridge compartment, extending the life of fruit and vegetables – no matter where in the fridge these are stored. At the same time, it uses smart power technology for up to a 42% power saving and offers features like Power Freeze and Power Cool modes to make ice and chilled drinks faster than Samsung’s competitors. The Twin Cooling feature also prevents the freezer from icing up and allows one to convert the freezer into a fridge. It also lets you turn the fridge off while the freezer is running. Perfect for when going on holiday. Also launched was the Samsung AR9500M air conditioner. It uses the company’s Wind-Free Cooling technology that enables users to obtain both a cooler indoor climate with optimal energy efficiency and without having to experience uncomfortable direct airflows. The wall-mounted AR9500M does this through its 21 000 micro air holes and a two-step cooling system, which when first turned on starts in a ‘Fast Cooling Mode’, before automatically switching to ‘Wind-Free Cooling Mode’, which creates cool still air once the desired temperature is reached. This approach will also reduce energy consumption by up to 72%. In addition, the unit is Wi-Fi enabled, allowing users to control it through the Samsung Smart Home app on their tablet or smartphone. Pricing was not available for the AR9500M but it will be available at Samsung branded stores in the next few months.